Facebook’s new face recognition software that has been added to its photo applications has caused a lot of buzz. Many people, including Martin here at Ghacks, have written about this feature, and there are a lot of security implications that such software carries with it (you can read that article here, which outlines how to disable such features). Many people get a little on edge once their likeness can be searched for and identified without their knowledge, often in photos they have never seen that may be displayed for the entire world to look at. That being said, face recognition software provides some very promising prospects for home photo organization and manipulation. It would be fantastic to be able to download a series of photos from your camera, click a button, and allow your computer to sort through them, categorizing each image by who is included in it. A series of photos could be divided into “stacks” – 13 images with Mom, 42 with your brother, another 40 with you, and so on. The same image would even appear in multiple places if done correctly, depending on how many people might be in the same image. Unfortunately, the prospect of uploading your photos to Facebook for such certainly isn’t safe if you ask most people, but the question is, is it feasible. As the developers at Facebook have been working through the difficult steps to make such sophisticated technology available on their website, so too have private developers. While some products of this nature have been available for a few years at a hefty price, a company called Applied Recognition has released a handy and completely free program called Fotobounce that does all the above scenario asks, and even a bit more. It allows you to keep your images safe from the perils of the Internet while providing all the features you want in facial recognition software. To give it a try, follow this link to Fotobounce’s website and get the program installed on your computer. The initial process is quick and requires very little input from users. Keep in mind though that the program requires Adobe Air to be installed on the system. Once installed, open up the program and take a look around. The interface is clean and simple, although the free product does include an advertising banner across the top of the screen. To begin, choose the folder you would like images to be scanned from. 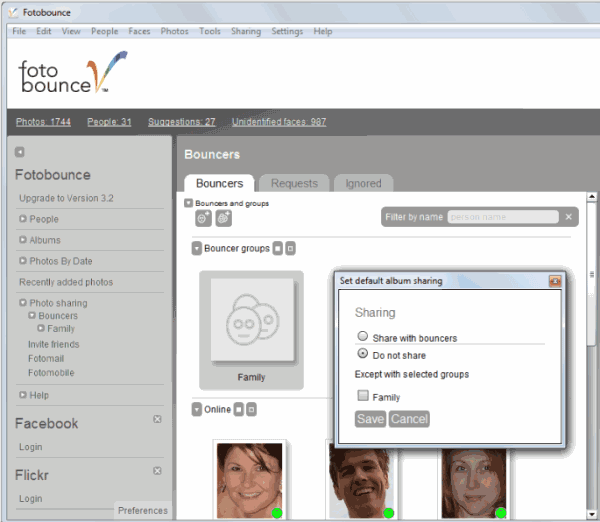 Fotobounce will then automatically evaluate every photo from that source, categorizing each person as “unidentified faces.” Simply click the Unidentified faces tab on the left toolbar and sort through them, naming different people. Once you have identified everyone, you can click on one name to bring up every image they are found in. From there, you can automatically upload a series of pictures of one individual to Facebook or Flicker. The power of Fotobounce is pretty incredible, and it takes a lot of sitting and fiddling with the program to understand everything that it can actually do. With a little time, however, you can have Fotobounce sifting through your entire photo collection, organizing it for future reference. No one blames you for not wanting Facebook to go out and automatically pull your face from the crowd. Still, face recognition software is pretty handy, and it can take a lot of the hassle out of photo organization. Picasa already does this, right? How’s it compare? Jason, from what I can tell the core difference is that Picasa will suggest tags for people that you have previously tagged, while Fotobounce does not require that . I have not used Picasa in a long time and things may have changed though, so take this with a grain of salt. Fotobounce also has a private peer-to-peer photo sharing network feature where you can share your photos with friends and family, who are referred to as “bouncers”. With Fotobounce you don’t have to worry about your privacy or protection of your photographs as you would with a public site. where does the program store the identified faces? as a tag in the file or in the program database?